It might be hard to believe now, but in just a matter of weeks, we will be saying hello to cooler weather across Loveland and Northern Colorado. For homeowners, that means a limited amount of time available to knock out those outdoor home improvement projects. Ensuring the readiness of your roof should be near the top of the list. 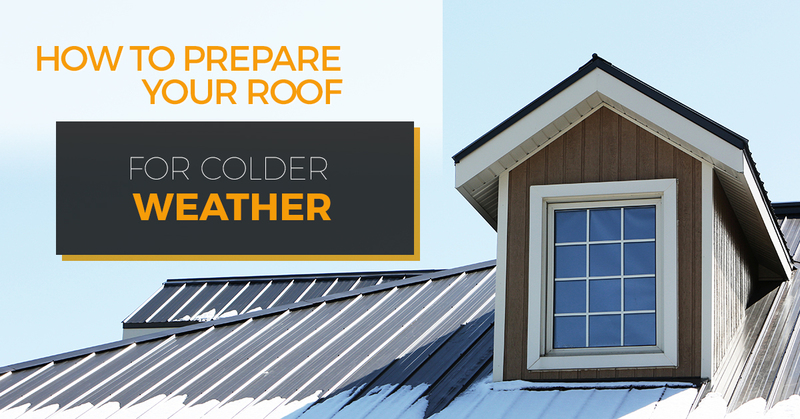 In this blog post, we explain how to prepare your roof for cooler weather. Clean it up – In about mid-October, it’s a good idea to start winterizing the roof. Use a push broom starting from the top of the roof and work your way down, picking up any fallen tree limbs and leaves. While on the roof, look for any damage such as missing shingles. Keep in mind that unless you have previous experience dealing with roof repairs, it’s best to leave it to an experienced roofer in Loveland. Rest assured that small repairs typically aren’t expensive and can help extend the lifespan of the roof. Lastly, clean the gutters of leaves and debris. In order to reduce ice buildup during winter, it’s imperative to have clean-flowing gutters. Inspect the attic – This is where homeowners will look at the ceiling for signs of water damage. Should you identify water stains, it could point to poor roofing insulation, which leads to water leaks. Not to mention, it’s easier for heat to escape from the inside, driving up the cost of energy bills. Consider that while replacing a few sections of a roof may seem like a reasonable DIY task, it’s once again best to consult a Colorado roofing contractor. They can get the job done right the first time, saving you money down the road. Watch for ice damming – For those who don’t know, ice dams form when heat from a home’s inside escapes through the roof due to poor or weak insulation. It melts the snow from the rooftop, which then runs down and collects in the gutters. This can cause an ice dam once the water freezes. How much of a threat do ice dams pose to your roof? Well, they can cause significant damage due to to the extra weight. When the weather allows it, clean off snow from the rooftop using a push broom or snow rake. Nobody knows Colorado quite like Schroeder Roofing in Loveland. For more than 40 years, we’ve been relied on as the go-to roof replacement company. We are proud to be a family owned and operated business that also calls Colorado our longtime home. Fully licensed and insured, we are members-in-good-standing with the Better Business Bureaus of Northern and Southern Colorado, the Colorado Rockies Association, and the Home Builders Association. When you’re in need of gutter services, insulation services, and residential roofing, you can feel comfortable trusting the experts at Schroeder Roofing. As your northern Colorado roofer, we will handle your roof repairs with ease. Don’t let your roof keep you up at night as we approach the colder months of the year. Instead, get in touch with Schroeder for a free estimate.